Alexander = King on Throne, Martini = Man in Tux, Tom Collins = Bum at Streetlight, Daiquiri = Female Flamenco Dancer, Bacardi = Male Flamenco dancer, Manhattan = Redhead in Tails, Whiskey Sour = Scot in Kilt Dancing and tasting. Well now, if you started on one of the 7 recipes and made it around the shaker, who knows what type of outfit you would be wearing!! 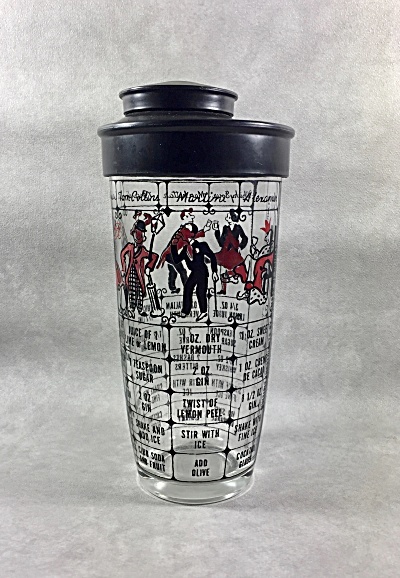 This shaker stands 7 inches tall to the top of the black plastic lid. What is interesting is that the lid has an offset top which covers the built in strainer. Most often, when one finds these cocktail shakers they are missing the original plastic lid. Here is what a complete one looks like. I suspect Hazel-Atlas as the maker of this shaker but I am not sure. I do believe it is American made in the 1950-1970 Midcentury time period. Cheers! Now where did I put that kilt! !